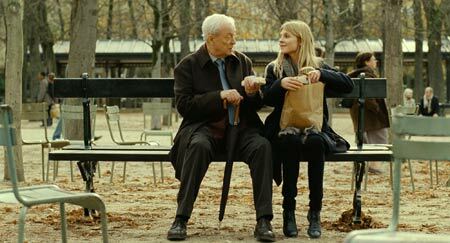 When suicidal widower Matthew Morgan (Michael Caine) meets the young Parisian Pauline (Clémence Poésy), he blooms one last time. Despite a fantastic cast and high production value, this delicate adaptation is a bit boring. 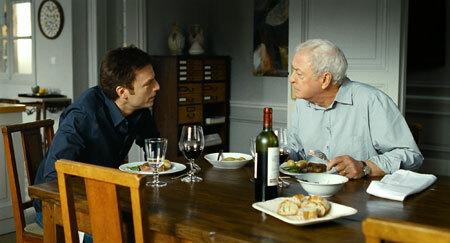 After the death of his wife Joan (Jane Alexander), the almost 70 year-old American Matthew Morgan (Michael Caine) hasn't moved back home, but has stayed alone in the spacey apartment in Paris. He talks with his deceased wife and still can feel her presence. The housekeeper (Michelle Goddet) comes once a week, and every now and then Matthew meets his friend Colette Léry (Anne Alvaro) for lunch. Then one day Matthew gets to know the much younger woman Pauline (Clémence Poésy), who helps him and walks him home. They are both lost souls, which is why they have an instantaneous connection. 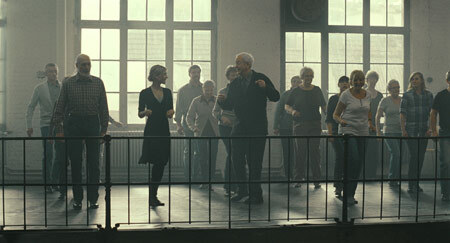 But only at a second chance meeting on the bus, the orphan Pauline invites the retired philosopher Matthew to the dance lessons she gives. Matthew hesitantly attends the free first dance lesson with Colette, but has a lot of fun. This is the foundation for the special friendship with Pauline. They go for a walk together, eat in the park, dance, support each other, talk about what's important and find new joys in life. Matthew even considers making Pauline his new family. But this idea and the friendship with a huge age difference do not appeal to Matthew's son Miles (Justin Kirk) and daughter Karen (Gillian Anderson) at all. The two come to the city of love on short notice, when Matthew gets hospitalized. And while Karen returns to her family soon after, Miles stays and tries to bring Matthew back to his senses. Pauline on the other hand tries to bring father and son closer together again. 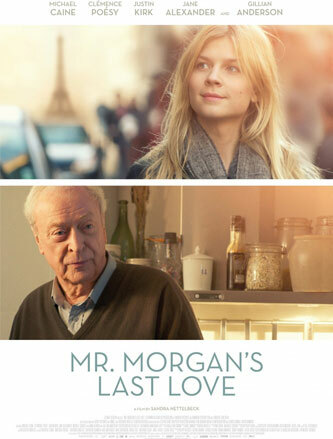 "Mr. Morgan's Last Love" is a German-Belgian-French-American co-production, which has been shot equally in Paris, Brittany, Brussels and Cologne. Thus the film has a certain French charm, which certainly is due to the adorable Clémence Poésy ("Harry Potter and the Goblet of Fire", " In Bruges", "127 Hours"); but it also has some American efficiency as well as some rather German boredom. That the film has an English original title shows clearly that the film is targeted for international and especially English-speaking audiences. In order to appeal to this market, the film needs to be in English, as films aren't dubbed in this language and especially Americans don't particularly fancy subtitled films. The filmmakers have succeeded in this with a simple trick. The film is based on the French novel "La Douceur Assassine" by Françoise Dorner and originally the protagonist is French. But for the screenplay the German director Sandra Nettelbeck (whose delicious German hit "Bella Martha" was remade as "No Reservations") has turned him into an American. Supposedly she already had Michael Caine in mind during the writing process (although he is British, which shows in his accent). The americanisation doesn't make much of a difference for the plot, but it leads to some awkwardness. Despite having lived in France for several years, Mr. Morgan doesn't even know the difference between polite "s'il vous plaît" und familiar "s'il te plaît" nor speaks the rudimentary French. This might be interpreted as American arrogance/ignorance or a personal quirk – or as a weakness of the screenplay. Perhaps this is supposed to be funny. But will the (to be expected) rather intellectual arthouse audience be entertained by feeling superior to the character? The story of Mr. Morgan's last love has a lot of things going for it and one can easily understand, why Nettelbeck wanted to adapt it. The cross-generational friendship and the deliberation of elective affinity are topics that aren't touched so often. Involuntarily one is reminded of "Harold and Maude", but without the cynical humour. "Last Love" topicalizes it rather delicately and slowly. Unfortunately the film isn't free of clichés (especially when it comes to the constellations with son Miles), but again and again good moments come up. Still the production is so delicate that it is oftentimes quite boring. What keeps the film afloat is definitely the cast. The ever-brilliant Caine and the incredibly charming Poésy have a great connection. The supporting roles have been cast nicely as well. An especially joyful surprise is Gillian Anderson (Scully in "The X Files"), who one would like to see more of. But she's gone all too soon. The design and the cinematography are nice to watch as well. The music of the German genius Hans Zimmer, who has a very successful Hollywood career going ("The Lion King", "Gladiator", "Inception"), lifts the production value even a bit higher. "Mr. Morgan's Last Love" is a movie for a placid, probably rather older audience which knows how to appreciate the approach of family values and ridding oneself of world-weariness.